Red brake calipers and larger wheels signal a higher-performance powertrain is on the drawing board for Jaguar's XE sport sedan. With many key engineers and leaders from BMW now working at Jaguar Land Rover, it only makes sense that the British automaker would develop a car that takes aim at one of BMW's crown jewels: the M3, for decades one of the world's most highly regarded sports sedans. 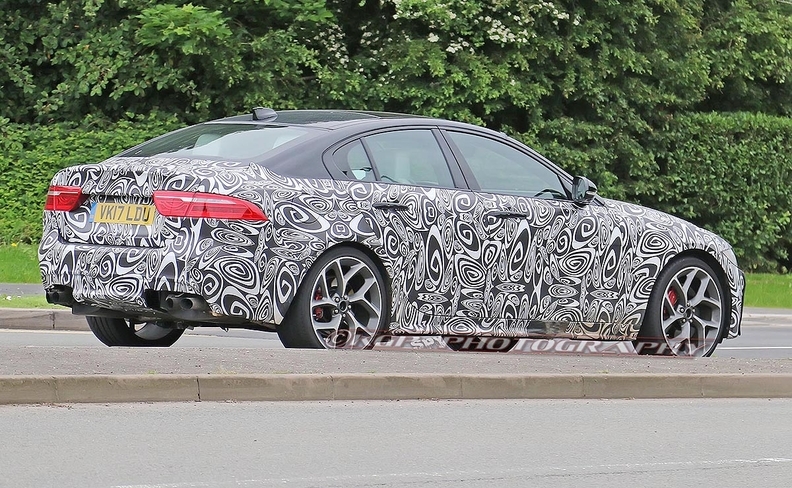 Spy photographers in England captured what appears to be a high-performance version of the midsize XE sedan undergoing testing. It's unclear which engine could be powering the car. While Jaguar Land Rover does have a 575-hp supercharged V-8 engine in its lineup, it likely would be too tall to fit under the hood of the XE. That's because the supercharger fits on top of the engine between the cylinder banks. Not only would it be a tight fit, it would make it difficult for the car to meet European pedestrian safety standards, which require sufficient space between the underside of the hood and the top of the engine so that the hood can deform as it absorbs the energy of a person landing on it. It also would be hard to stuff a pair of turbochargers under the XE's hood with a V-8 engine. The hot rumor in England is that Jaguar Land Rover engineers are preparing a new straight-six engine based on the four-cylinder Ingenium engines currently in production. When JLR announced the Ingenium family in 2014, it went to great pains to explain that the architecture would be flexible, configurable and modular. That means, with each cylinder being 500 cc, or one-half liter, and using the same valves, pistons and other parts, JLR could produce it on the same assembly line as three-cylinder, four-cylinder or six-cylinder engines. In any case, perhaps a shot of adrenaline is what the XE needs to kick-start sales. The car, which has won good reviews, has been overshadowed by the hot-selling F-Pace crossover. In regard to appearance, there isn't much in the spy photos that separates the XE SVR -- if this is what that vehicle is -- from more pedestrian versions. Only the red brake calipers and larger wheels signal a higher-performance powertrain.